‘The Queen’: The first tale begins in the kingdom of Darkwood (Italian: Selvascura), where the King and Queen have tried everything to have a child, but are not successful. The King loves his Queen, but all she desires is a child. One night, a necromancer provides a risky alternative: the Queen must eat the heart of an aquatic dragon cooked by a virgin, which will make her instantly with child. However, this will also come at the cost of a life. ‘The Flea’: In the second segment, in the kingdom of Highmountain (Italian: Altomonte) the King lives with his daughter, Violet. Violet loves her father and while rehearsing a song that she has written for him, the King notices a flea that mysteriously can travel from one hand to the other. Distracted by the flea, the King barely notices his daughter’s performance. He then captures the flea and hides it in his room, making it his beloved pet, fed on blood and steaks. The flea gradually metamorphoses into a gigantic Kafkaesque domesticated creature. ‘The Two Old Women’: In the third segment, in the kingdom of Stronghold (Italian: Roccaforte), the lustful King is intrigued by a mysterious woman’s celestial singing. Adamant in seducing her, he courts her outside her home, unaware that she is one of the two elderly dyer sisters Imma and Dora. The lustful king is persistent, so Dora agrees to spend the night with the king, as long as it is in complete darkness, so to hide her appearance from him. The three distinct stories are linked thematically, primarily focusing on dark stories with harsh lessons about being careful what you wish for. One of the main themes is around characters having to live with the consequences of their actions and decisions, and the ways in which this is badly handled by several of them. The segments feel both grounded yet surreal, taking place in medieval times where kings and queens rule in large castles across the land. The production design is particularly on point with this, using some of Italy’s sparsest castles as locations and really serving to immerse the viewer in this world. Garrone has assembled a strong cast to bring these stories to life, with Salma Hayek shining as the jealous queen and the always impressive Vincent Cassel particularly standing out as a lustful king. 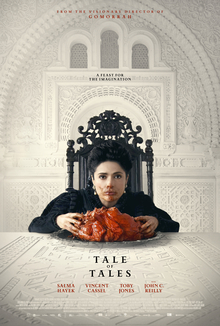 ‘Tale of Tales’ is a unique film with a clear vision from its director to bring these fantastical stories to life, and whilst they are based on the surreal there are clear reference points and lessons to take from the actions and decisions each of these characters make throughout the narrative.